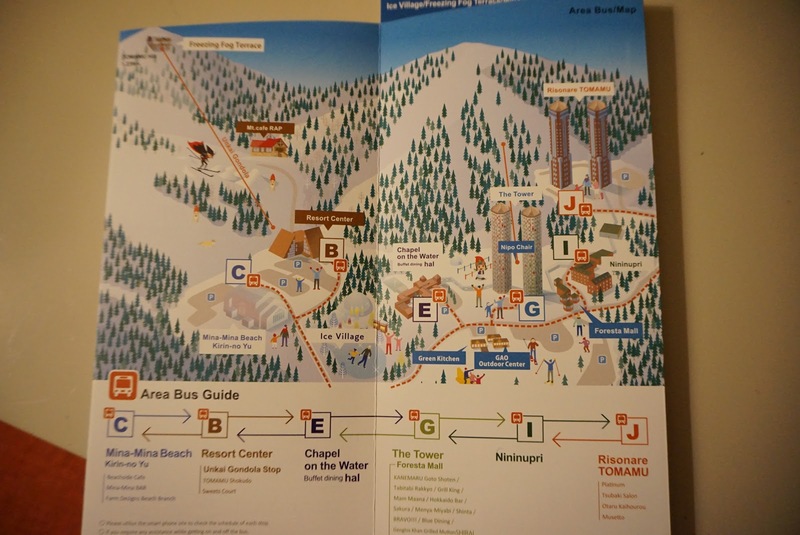 Tomamu Ski Resort is located about 2 hours East of New Chitose Airport via JR Train. To get there, hope on the JR heading towards Kushiro from Minami Chitose Station (one station from New Chitose Airport) and alight at Tomamu Station. 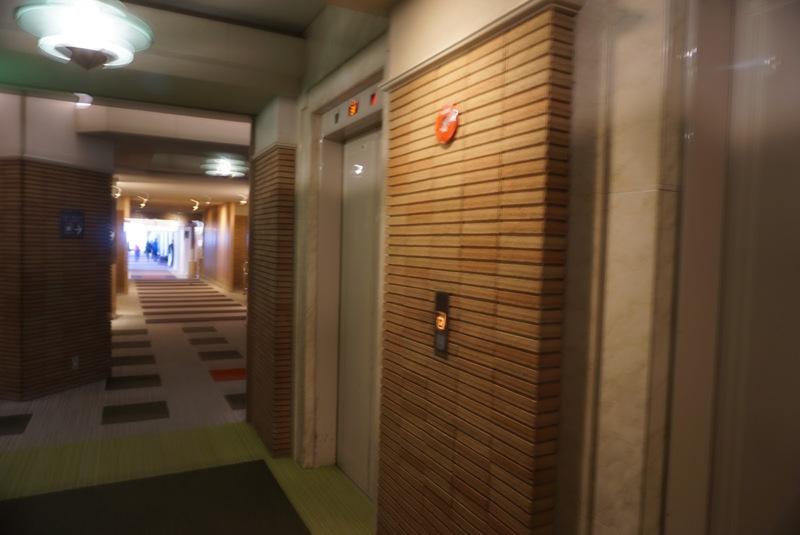 From the JR station, there are complementary buses provided by the resort to pick guests up. Shuttle buses are timed according to the arrival and departure of JR Trains. No pre-booking for these complementary shuttles are needed. 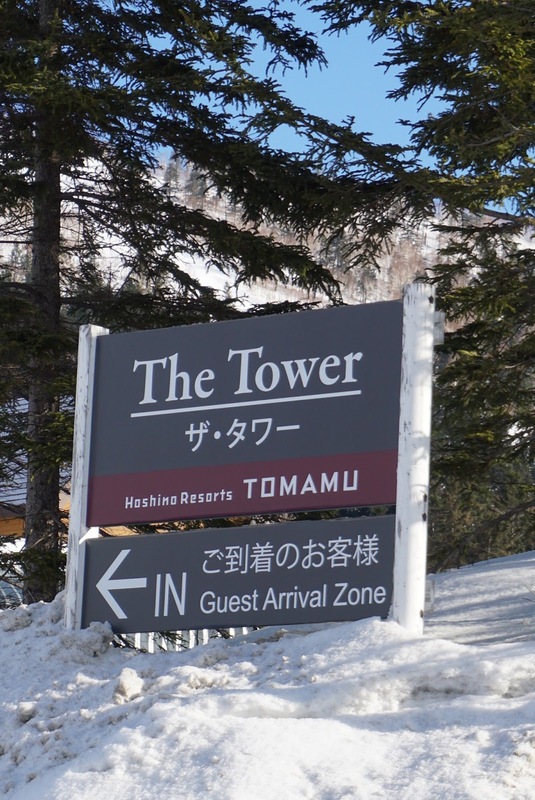 Hoshino Resorts has 2 properties in Tomamu Ski Resorts, namely The Tower and Risonare Tomamu. 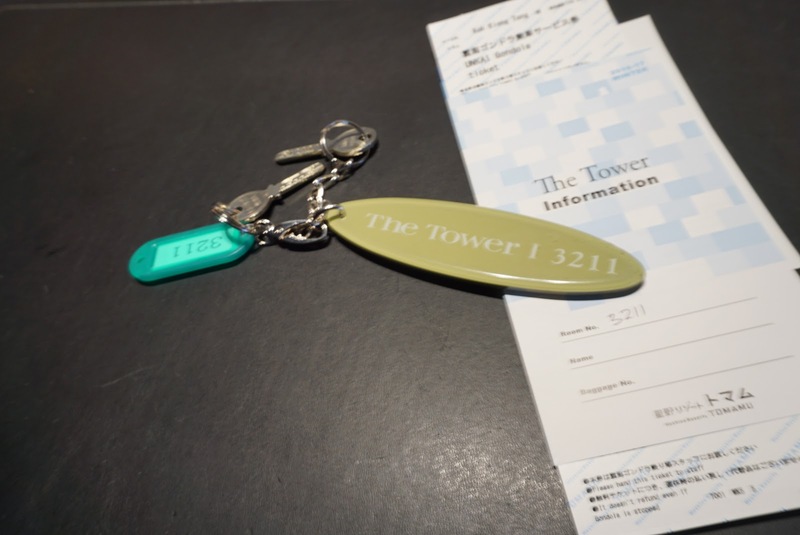 The Tower is located about 5 mins bus ride from Tomamu JR Station and is at the heart of the resort. It is conveniently located with access to restaurants and other facilities in the resort. The only supermarket in the resort as well as the Ski Academy is located on the ground floor of The Tower. We booked a twin room and were given an upgrade to the Standard Fourth Room. 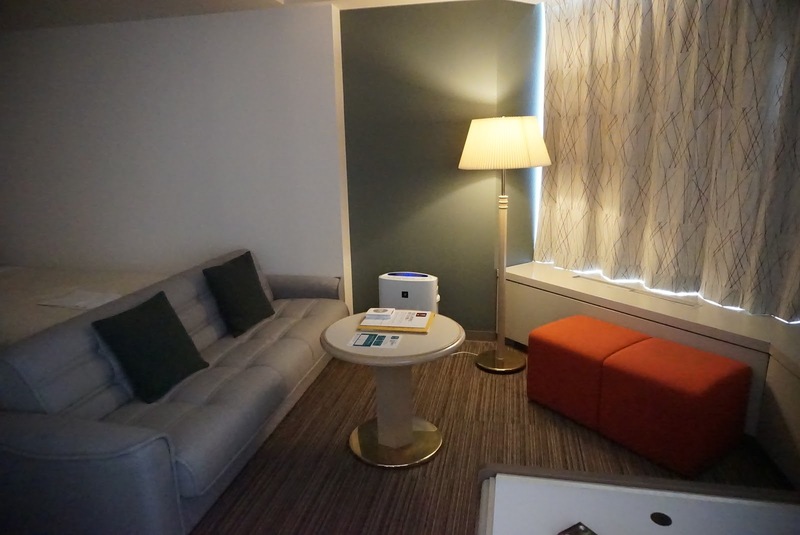 The 50㎡ contemporary room is very spacious with 4 single beds for 4 adults, and comes equip with 2 toilets. There are sufficient space for guests to open up their luggage on the floor. 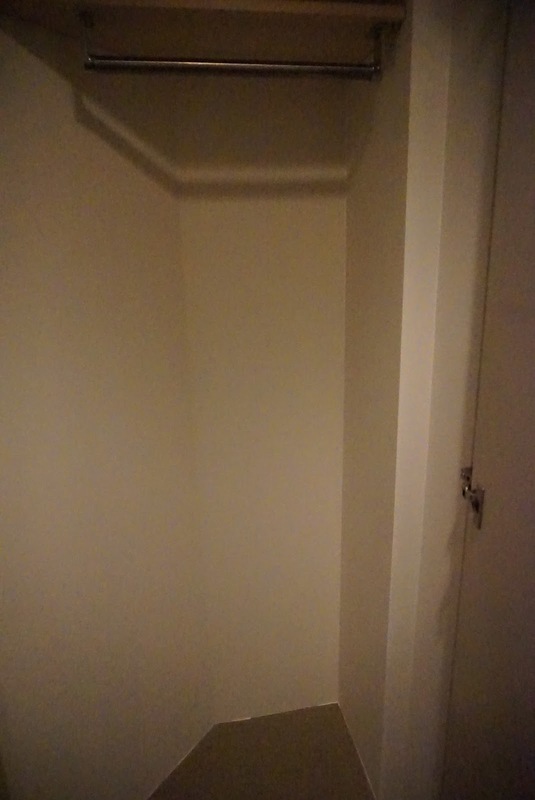 Entering the room, the first toilet is immediate to the right of the entrance (more on the toilet below), to the left, flushed into the wall is a cabinet that guests can hang up their clothing. Alongside the wall next to the cabinet are 4 mounted hooks, great for hanging winter jackets. There are 2 bedding areas in this room. One of them is immediate to the right of the entrance to the room, after the toilet. 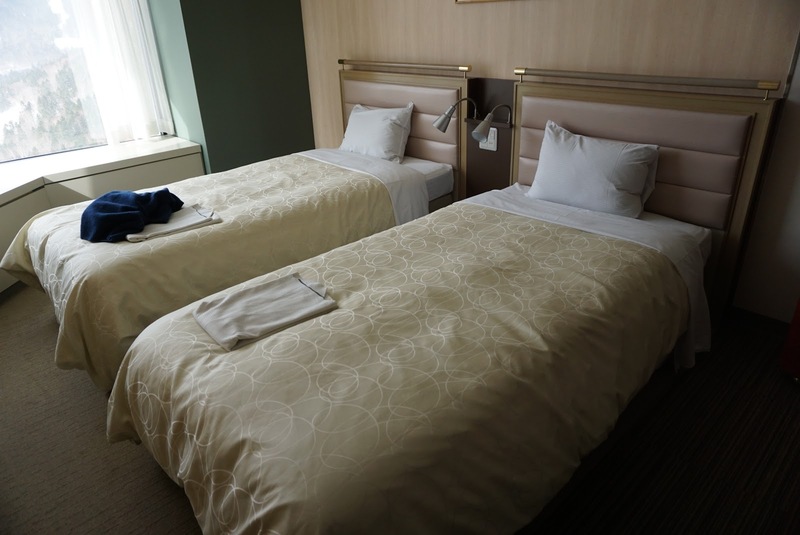 2 single beds are placed in a corner, next to the large window that looks out into the ski resort below. This bedding area is brighter due to the proximity to the window in the day. There is a small powder table beside one of the beds. The sleep quality on the bed is excellent, I always have a great nights sleep resting on them. The pillows are not too soft, to my liking. The other bedding area is tucked further into the room, at the corner behind the living area. 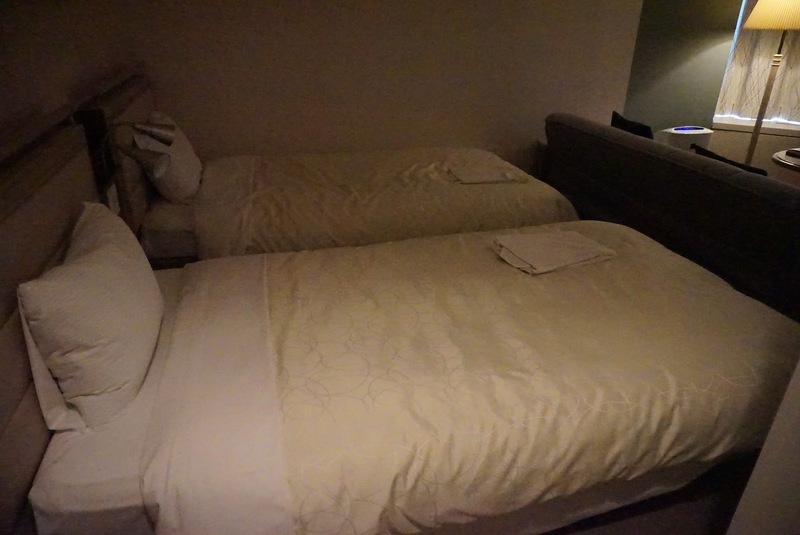 There are another 2 single beds placed next to each other here. The bedding area benefit from being directly facing the TV, however due to the distance from the window, it lacks the natural light in the day. The lightings in the room sufficiently brightens this area. There is another wardrobe beside this bedding area creating more space for guests to hang their clothing. Further into the room between the 2 sleeping areas is the living area. A stand alone cabinet forms a separation to the living area. 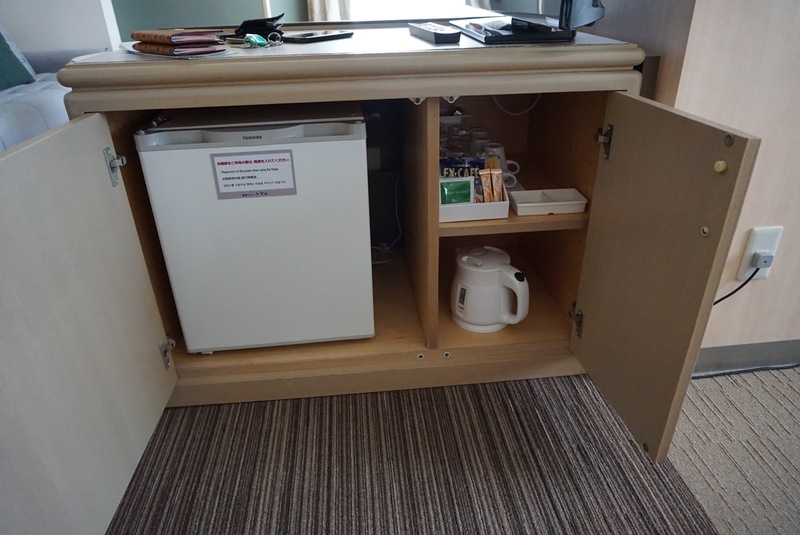 The mini fridge (which is empty) and complementary tea and coffee is well hidden in the compartments of the cabinet. A large LED TV is found on top of this cabinet. There is another table placed behind the cabinet, which can be used as a place to charge one’s lifestyle devices. There are 2 power outlets (Japanese plug) at the side of the cabinet. Behind the cabinet is where the living area is located. A 3 seater couch facing the TV and another large window with a small coffee table allows occupants of the room to sit around and mingle. There is a 2 seater stool placed by the window. The 2 bathrooms in the room are identical. 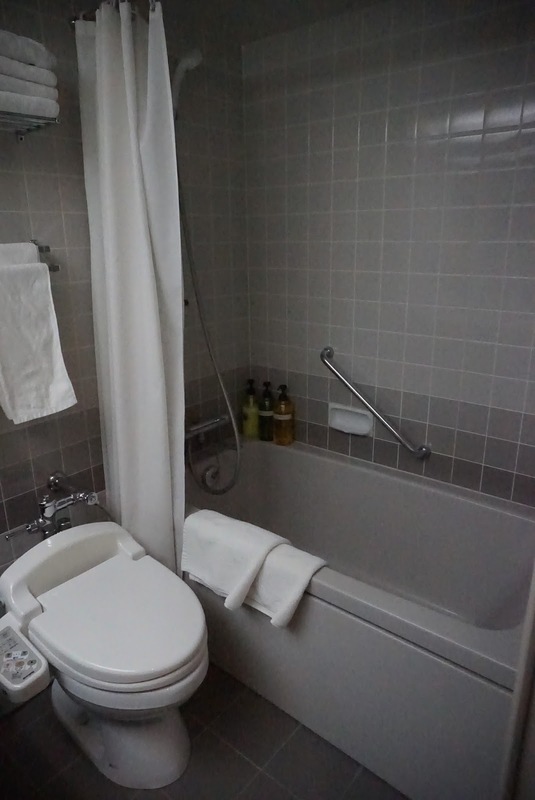 The first bathroom is located next to the entrance of the room, while the other is tucked into a corner of the room beside the second bedding area. 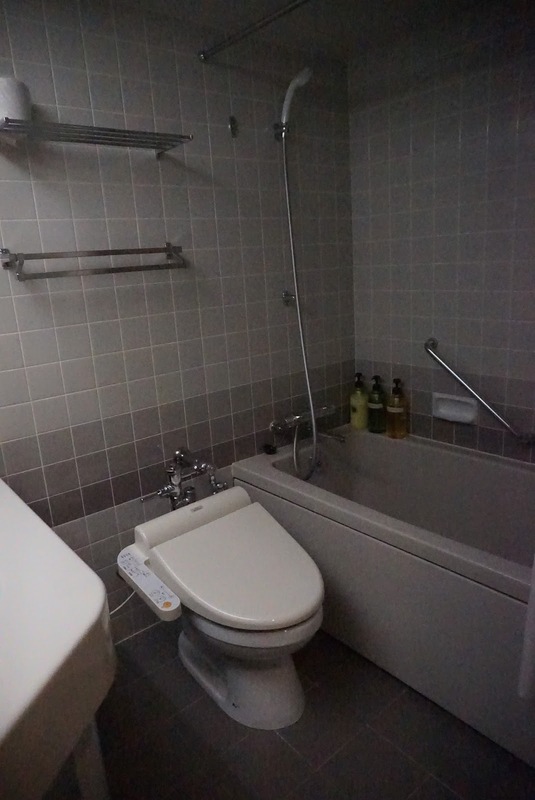 Both bathrooms are large in Japanese standards. 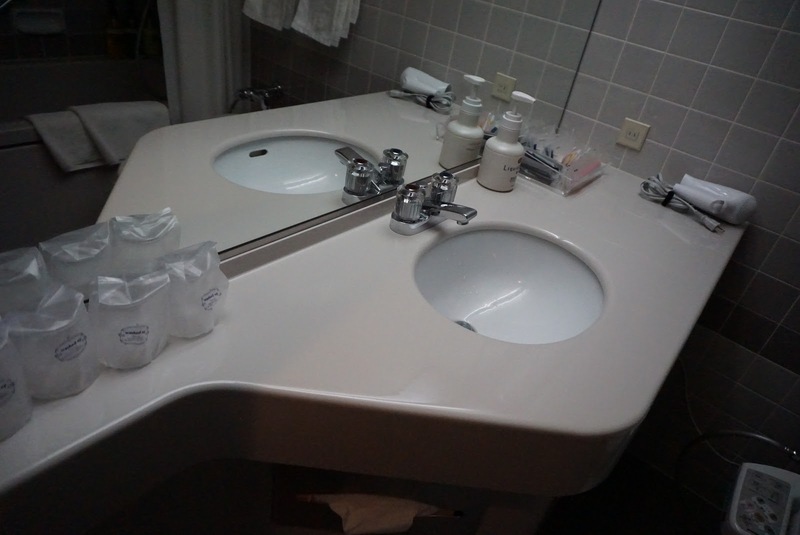 Entering the bathroom, the sink area, which is large enough for 2 guests to put their toiletries on (depending on how much toiletries one has). The hotel is thoughtful enough to provide 4 different coloured toothbrushes for guests. 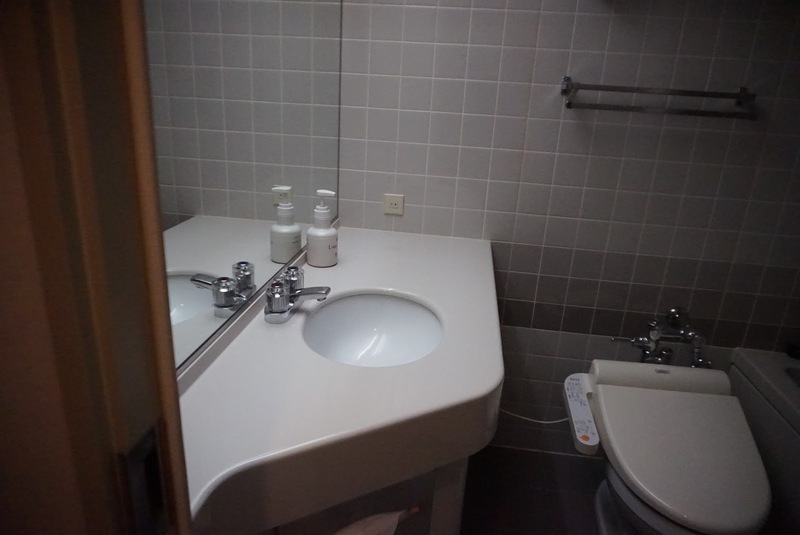 Next to the sink area is the toilet bowl, which has an automatic washlet, a common feature in Japanese hotels. The seats on the toilet bowl are heated, perfect for cold winter weather. Next to the toilet bowl is where one can find the bathtub. This bathtub is rather deep, and can provide guests with a good soak in. The bathtub also doubles up as a shower. Guests who booked the bed and breakfast package were given 1 ticket to breakfast for each day. What I like about the breakfast arrangement is that guests are not restricted to having breakfast in one particular restaurant. We were given the liberty to choose any restaurant that opens for breakfast in the entire resort to have our breakfast. 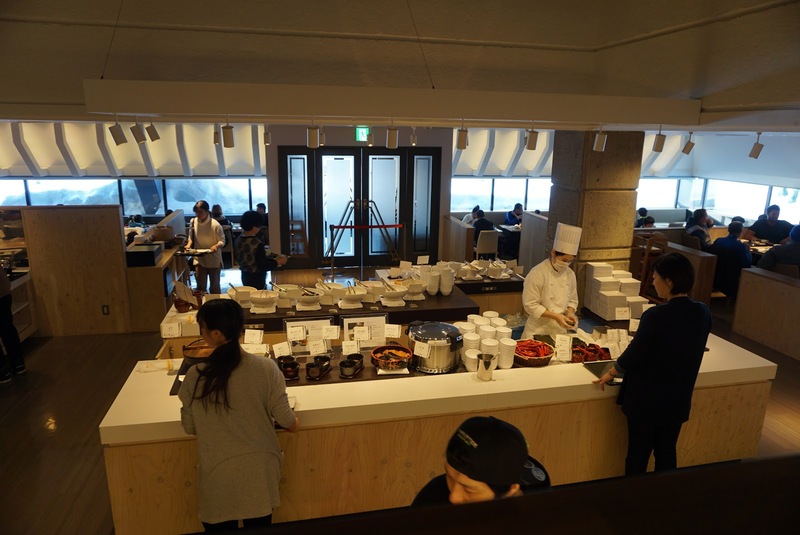 I went to the Mikaku restaurant, which is located below Tower 1 to have breakfast. Although the restaurant is small, there are no lack of quality food here. 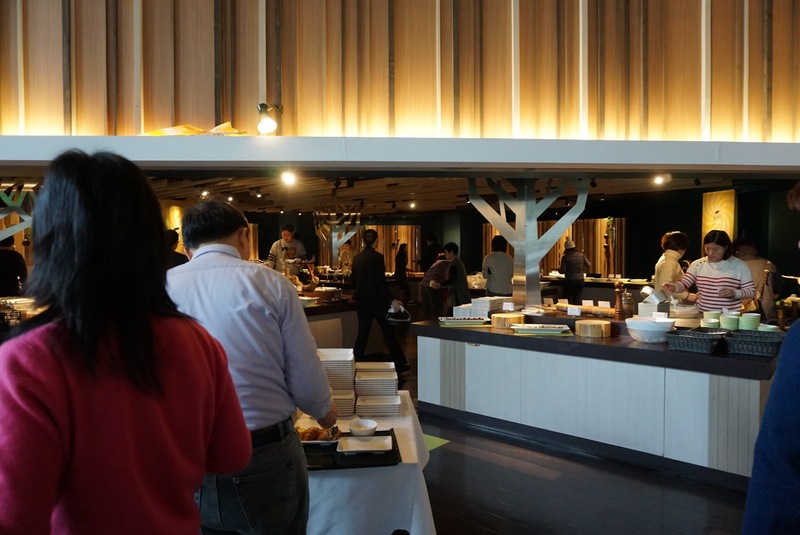 The food offering is delicious and has both Japanese and the standard western breakfast offering. I tried another restaurant – Nininupuri, which is some 7 mins walk located between The Tower and Risonare Tomamu. 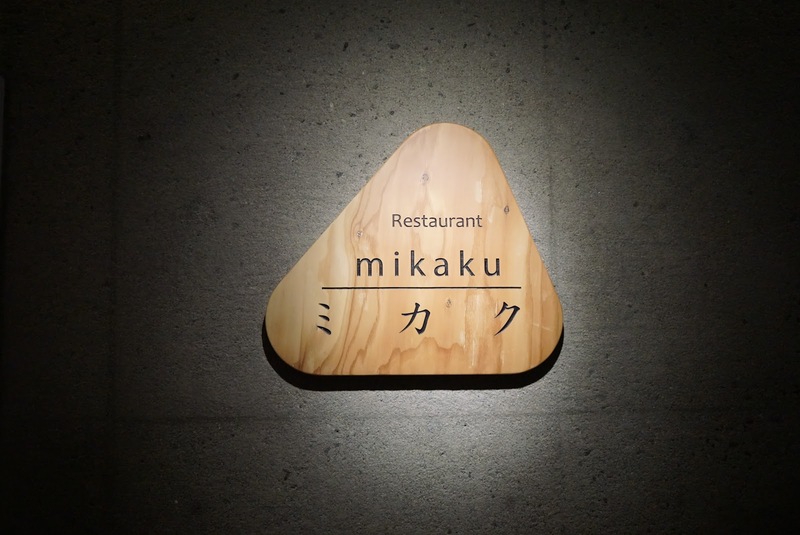 This restaurant is bigger and has more food offerings, but I find the food here not as good as Mikaku. 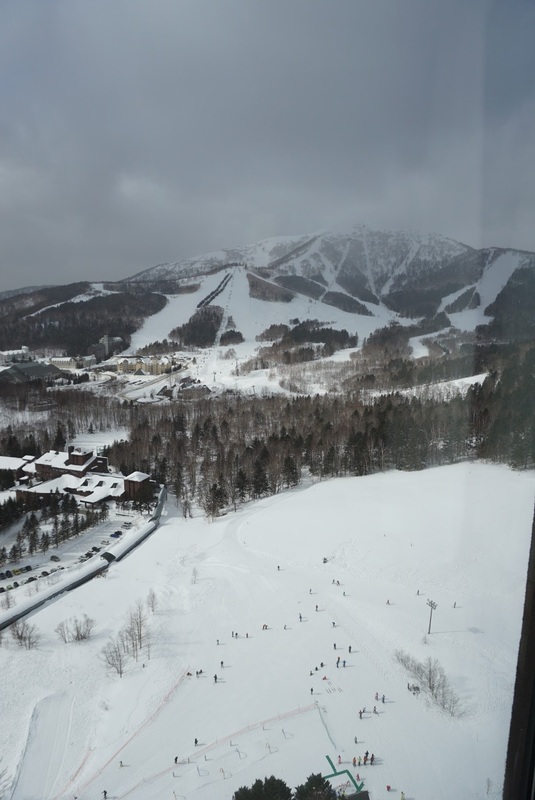 Hoshino Tomamu Resorts is built on a ski resort, there are plenty of facilities around to cater for both skiers and non-skiers. For skiers, there are 29 courses catering to all levels of skiers. 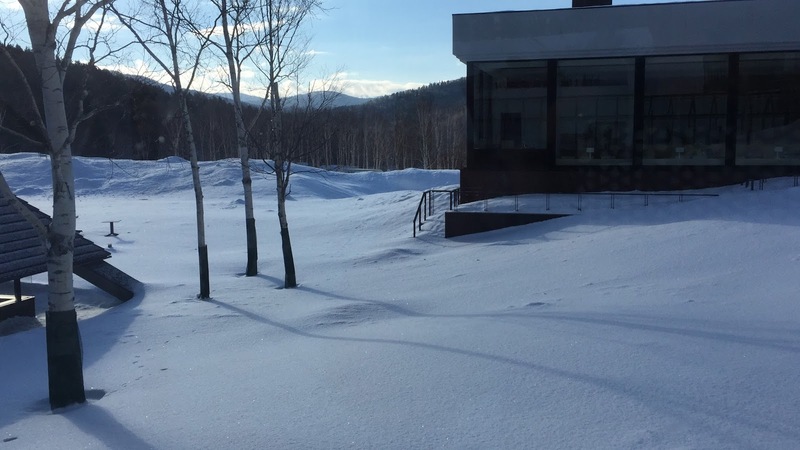 There is even an academy that offers lessons to non-skiers at a reasonable rate. 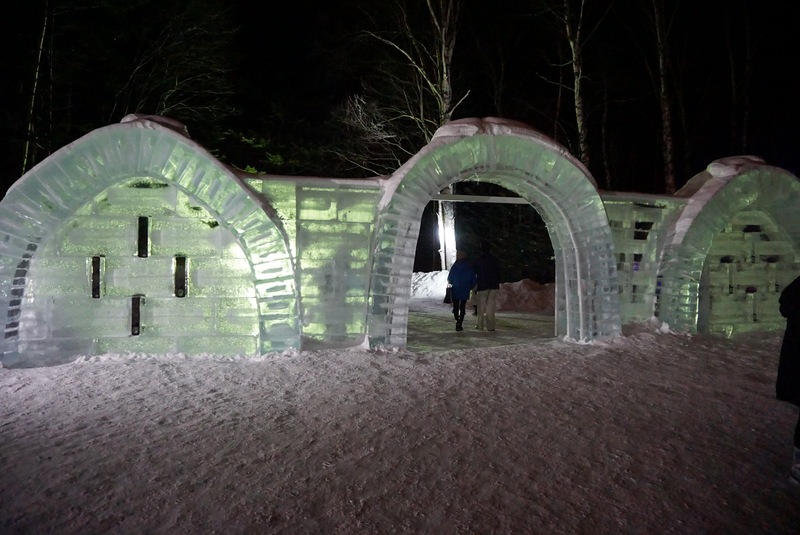 For non-skiers, there are sights such as the ice-village and Unkai Terrace that will keep on occupied. 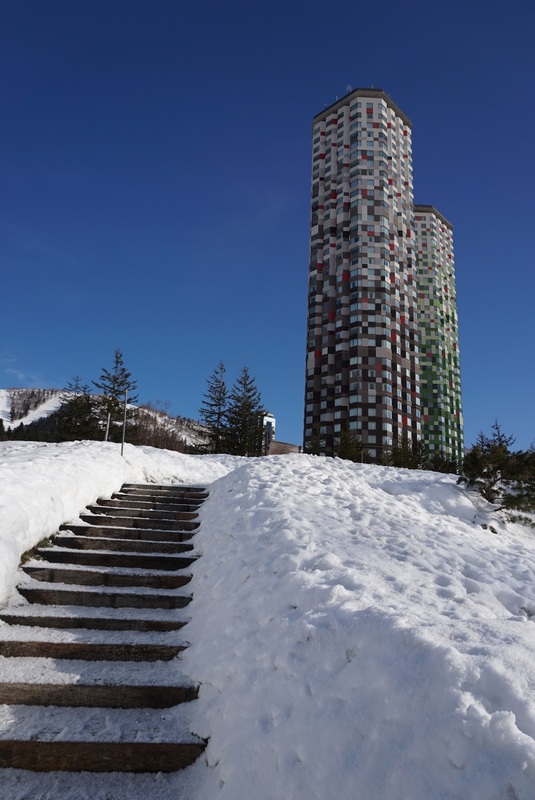 Non-skiers can also enjoy their time in Tomamu Ski Resort with facilities such as the Mina-Mina Beach, sledging and snowmobiling. I tried skiing here for the very first time and as a non-skier, I do not find the resort boring. 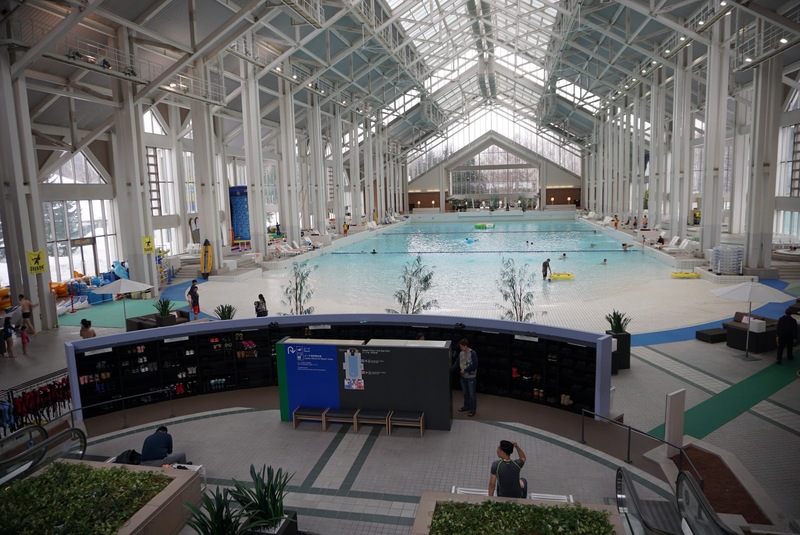 At The Tower, there is the largest retail shop right on the first floor of the hotel, where people all over the resort would congregate to get things from food to ski gears. There is also the Foresta Mall within 3 mins walk from The Tower Hotel, where one can find reasonable priced food. The service at Hoshino Resorts The Tower is nothing short of exemplary. There are staffs all over whom are ready to help any guests at any time. The great service started at the check-in. 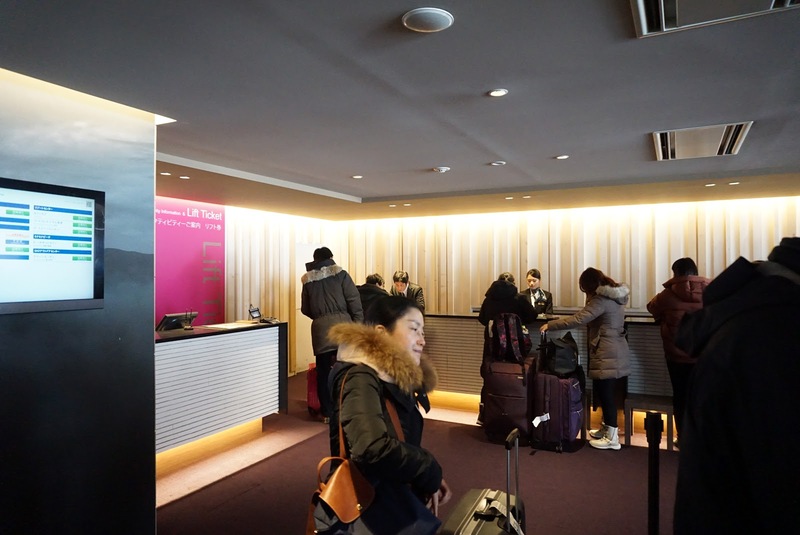 Despite being very busy whenever a shuttle bus pulls into the hotel from the nearby Tomamu JR Station, the staffs handled check-ins with a smile and with the signature Japanese efficiency. Despite being earlier than the check-in timing, we were given our room. The staff at the reception spent some time briefing us the facilities in the resort and how to get there. The hotel took note of my request when I booked my room with them, they assigned me the room that I requested for. 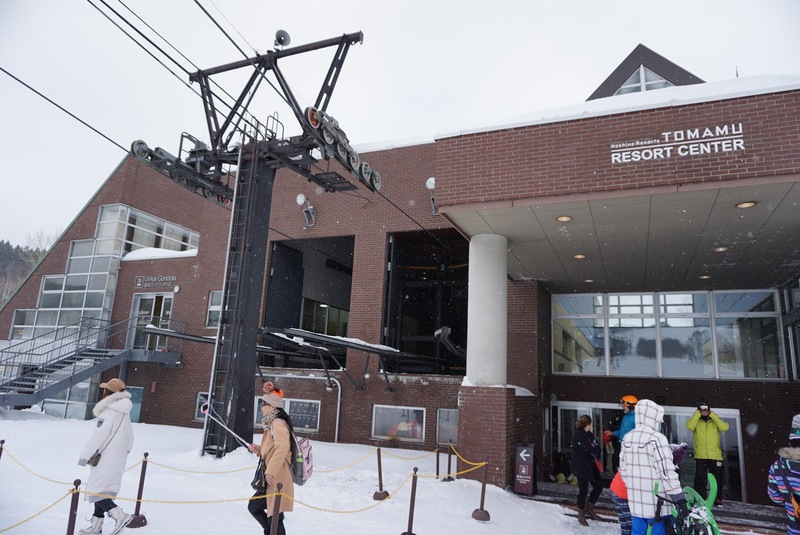 There are staffs placed at the shuttle bus stop in front of the Hoshino Resorts Tomamu The Tower, welcoming guests and helping them with the bus timing despite the cold weather. These staffs are ever so friendly and that smile on their faces never ceases. The housekeeping staffs were excellent as well. Not only did they did a great job cleaning our room, whenever we bumped into them in the corridor outside our room, they will always greet us with a smile and asked how was our day. There is always at least a staff standing in the lobby, announcing the next shuttle bus to Tomamu JR Station tirelessly. The staff always looked out signs of guests being lost and I witness a staff approaching a guest whom appear lost and helped her. The staffs at the restaurants throughout the resort were friendly too. During breakfast service, they made me feel welcome and the empty plates on my table were always promptly cleared. Hoshino Resorts Tomamu The Tower is a fabulous hotel. 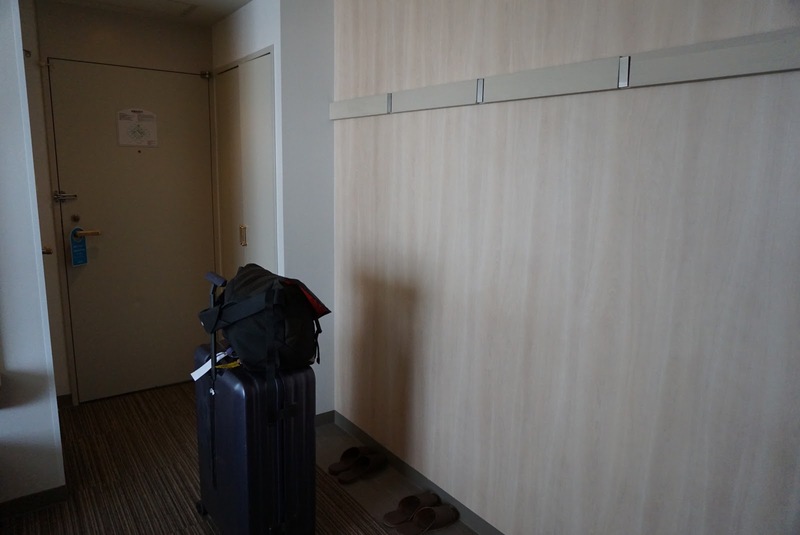 The room was very well designed and is fairly large. The sleep quality in the room is excellent and provided me with a great rest so that I can enjoy my time at the resort. The view from the room I was assigned was great, with views of the ski area and Mt Tomamu. 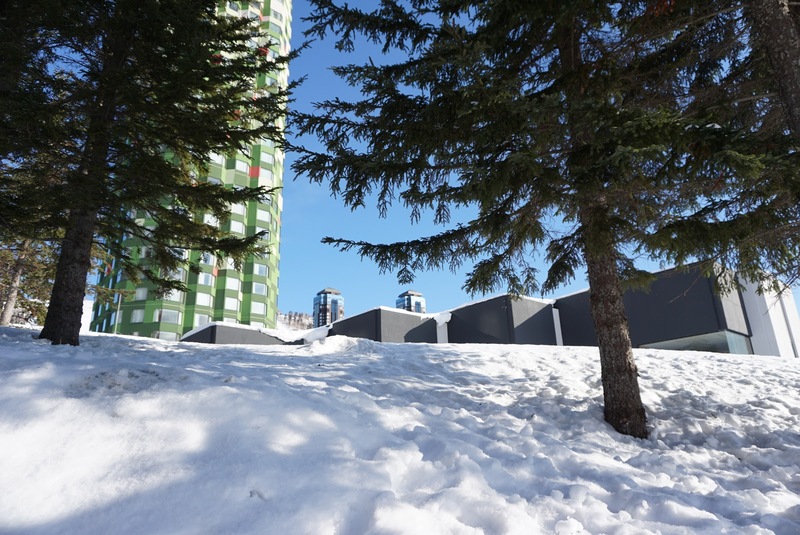 The resort is built for skiers with the large number of ski slopes and the soft snow. Non-skiers were not left out as well with the numerous facilities to ensure everyone can enjoy a great time here. Service rendered by the staff were excellent. They always make me feel welcome and every staff were not stingy with their smiles. 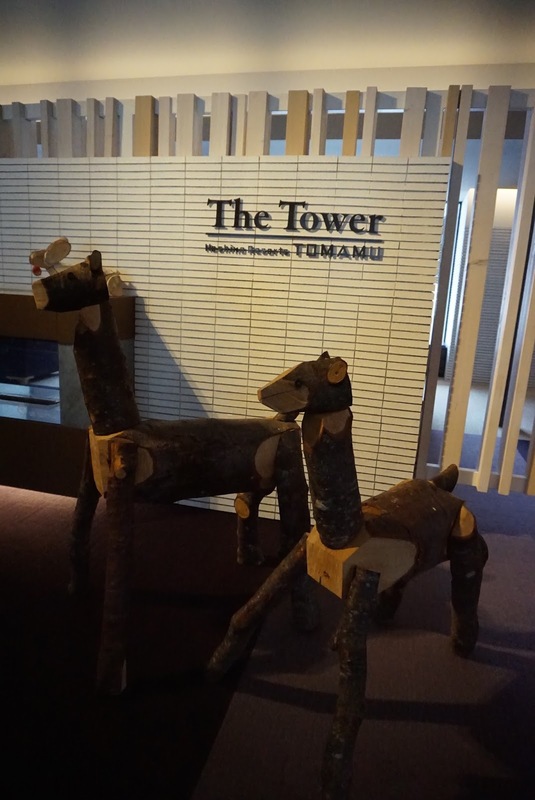 I would come back to this hotel the next time I visit Tomamu.